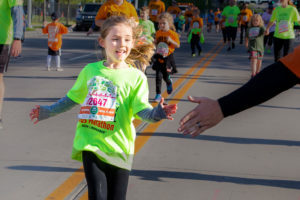 The Kids Marathon hopes to encourage children to live a healthy lifestyle, while teaching important lessons from the Oklahoma City bombing on April 19, 1995. It is a Run to Remember and a race to show that we can each make a difference in this world. This race is unlike any other, because it educates children about the history and mission of the Oklahoma City National Memorial & Museum, and gives them the opportunity to commit to the Oklahoma Standard. The earlier you get involved, the more time you have to encourage, educate, and enjoy this event!